In a match that didn’t see much in the way of goals or even an array of well created chances, Tottenham managed to nick a goal from a moment of brilliance and come away with all three points, 1-0, over Everton at White Hart Lane. Kyle Walker’s quick thinking and Emmanuel Adebayor’s cool finish were all that separated the sides on the scoreboard and the dynamics of the match in general. Spurs looked more organized and tight in the defensive phase than they ever have under Tim Sherwood as they did an excellent job to stifle the creativity that has often been seen from Everton under Roberto Martinez’s reign with the club. Sherwood deserves a lot of credit here for Spurs’ performance including a bit of pulling a Mourinho with his comments in the build up to the match. He stated midweek that Spurs did not need to adapt their approach against Everton as the Merseyside outfit would not be altering their approach to face Tottenham. Naturally, Everton’s possession based attack working around a five man midfield, including a central three, would be the way to attack Spurs anyways, so he was right in saying they didn’t need to change anything. But Sherwood did. After switching back to the 4-4-2 for the Hull City match, we saw the return of the 4-1-4-1 defensive block against Everton with Nabil Bentaleb in the holding role behind a central pairing of Paulinho and Mousa Dembele. Out on the flanks Lennon started right and Eriksen took his less effecitve left midfield position, all five in behind Adebayor. This matched up perfectly with Everton’s two holding mids and advanced mid, the 1-4 being the perfect inverse to a 2-3 midfield, and Everton created next to nothing through the middle areas after the opening fifteen minutes or so. Spurs looked set to face their usual issues defending the middle areas early on, most glaringly highlighted by a Leon Osman shot from just outside the area in the seventh minute. Osman was completely free to receive a pass and shoot from a central area and only an outstanding save from Hugo Lloris kept the match 0-0. Osman had four assisted shots in the opening stages but after Spurs settled down defensively his influence in front of goal dissipated, he had just one further shot on goal the entire match. Osman played centrally in place of Ross Barkley and Barkley’s outstanding talents were missed sorely, as was Everton’s lack of a natural striker. Steven Naismith was most often Everton’s furthest man forward but offered little, in fact, nothing, he had no shots in the match and his passing was poor, 16 of 25 completed, just a 64% completion rate. Naismith is neither pacey or physical and he, along with Mirallas later on, gave Spurs centerback pairing of Dawson and Vertonghen very little to worry about. Both had relatively easy and quiet matches and were asked to do far less than usual because the fullbacks and midfield players around them were stellar defensively. It’s a bit of a wonder Martinez didn’t throw McGeady up top from the start as at least his pace may have troubled Dawson and Vertonghen. Tottenham settled down and had their first couple bits of solid possession on about eleven minutes and after not getting punished from Everton’s early blitz, neither side created much of anything threatening. Spurs had a half decent chance to break around the twenty-seventh minute when Lennon was able to burst down field on the ball but got nothing from it. Throughout the match when Spurs did have chances to break they were often too slow in breaking out to take advantage and Everton was allowed to recover. Two reasons were present in Spurs essentially stifling themselves on the break. First, Adebayor often dropped off to the left channel instead of staying centrally and took possession as the outlet player where he could be cornered against the touchline and the moment to break would slip away. This is nothing new from Adebayor but it is a strategy that works better for him when he is paired with Soldado, as one of them can go wide and the other can stay so that one of them is constantly providing a central outlet to break out from. Adebayor stayed central a little more often in the second half and indeed was the furthest man forward in a central position where Walker was able to find him with a quickly taken free kick around the center circle as Dembele was still on the ground from the challenge and Everton momentarily switched off. The other reason was Dembele, statistically, he had a fantastic game, he had six successful take ons and completed 42 of 47 passes, 89% of his attempts. But, his take ons were in central positions in the middle of the pitch, an area where he should be looking to play a forward pass instead of taking on defenders. The old cliche is a cliche for a reason, the ball always moves faster than the player, and too often Dembele slowed a break by holding onto the ball instead of looking to hit a forward pass and keep the momentum going. Bentaleb had his quietest game in the possession phase, attempting just twelve passes in the first half, with the two teams fielding a combined ten midfielders and both teams determined to control the middle it’s no wonder he struggled to get on the ball. 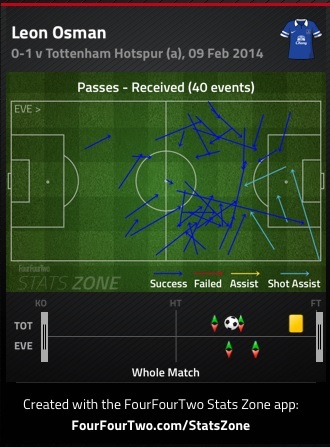 But he did provide the thing that has eluded Spurs so often under Sherwood, a screen for the back four. In the first half he completed three of six tackles successfully and made four interceptions, and he made them in an area that was highlighted last week against Hull, an area where almost no interceptions were made. When halftime arrived the match was scoreless, possession was split 50/50 and only Everton’s early spell had provided any shots on target. 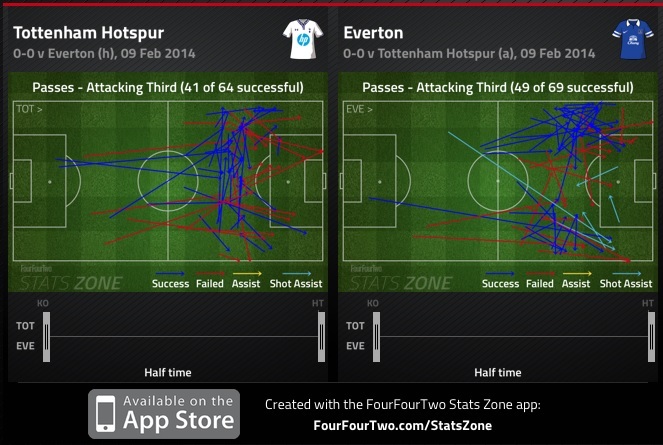 Spurs went in to the break with three shots, none on target, Everton had eight, three on target. Both sides approach in the defensive phase was very similar, Everton did press higher up and with more energy than Spurs, but for the most part both teams were content to allow the other possession in the wide areas and nothing in the middle. Creativity was at a premium for both Spurs and the Toffees. And that’s more down to the defensive mentalities than anything else, Sherwood’s Spurs and Martinez’s Everton are not afraid to go forward but they ground each other to a halt. The match needed substitutions to break the deadlock as both sides weren’t necessarily lacking quality but inspiration in the possession phase. The first to make a move was Sherwood, a welcome change after sitting on his starting eleven for 89 minutes against Hull, but a most unwelcome substitution, Christian Eriksen off and Andros Townsend on. Bringing on Townsend made sense, get him out wide and let him and Lennon have chances to breakout with pace on either side of the pitch. Previous to this Eriksen and Lennon did the old Bale and Lennon thing of randomly switching flanks, which is a fine idea as they offer different threats going forward. But to take off the most creative passer on either side in a 0-0 match? Perplexing. Surely, Dembele or Paulinho off for Townsend with Eriksen moving inside was the better move. Martinez responded in short order, three minutes after Sherwood’s move he brought on his most dynamic playmaker and removed Pienaar, who had been tidy with his passing but offered nothing incisive. Before Everton had any chance to let Barkley settle in, Spurs got their goal. Then Sherwood continued the chess game with Martinez and removed Paulinho for Etienne Capoue, on sixty-eight minutes, he brought on his true holding midfielder in place of Paulinho and pushed Bentaleb further forward to play centrally alongside Dembele. This is the type of three man midfield Spurs should operate with all of the time. Whether Sherwood’s move for Capoue was a reaction to the goal or the introduction of Barkley, it doesn’t matter, he was using his bench to try and keep control of the game. A welcome sign. Within in five minutes of Capoue coming on, with Everton now chasing the game, Martinez finally brought all his offensive weapons to bare on Spurs, subbing on Adian McGeady and Barcelona’s on loan playmaker, Gerard Deulofeu for Naismith and Osman. If Deulofeu and Barkley had been fit and McGeady around a little longer, Martinez might have well started with this trio and caused far more problems for Spurs. After the substitutions Mirallas went top with Barkley in behind and McGeady left, Deulofeu right and still sitting with the dual holders of McCarthy and Barry. Another highlight of Spurs efficiency in defending the central areas was that the two highest passing combinations from either side in the match were McCarthy to Barry and Barry to McCarthy, each passing square to the other a combined twenty-four times. 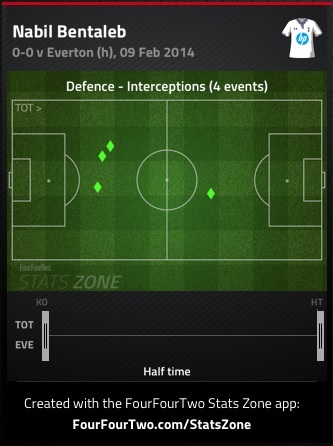 The rest of the match saw Spurs sitting slightly deeper in their half and more willing to concede possession to Everton. They were no means parking the bus, but not as energetic in their pressing higher up the pitch than earlier on. Despite the introduction of three attack minded players, Everton were continually a non-threat to Spurs in the closing twenty or so minutes. They would have just three shots, none on target, in the second half despite pushing the possession battle from 50/50 to 54/46 in their favor by matches end. 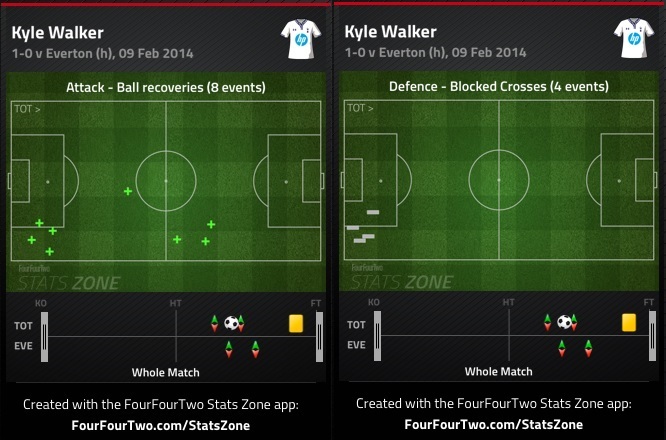 Spurs themselves had just two shots on target, from a total of five in the second half. 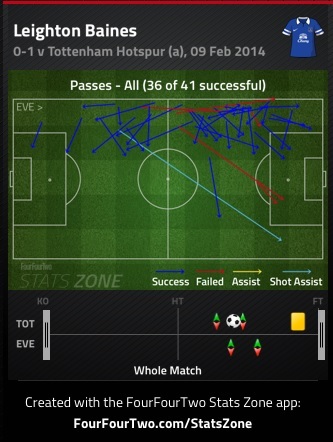 Both sides crossing was horrible, both Spurs and Everton attempted 22 crosses and both completed 4. That’s 8 of 44, which might not sound as bad if anyone watched the Manchester United game after Spurs, but it is still poor. 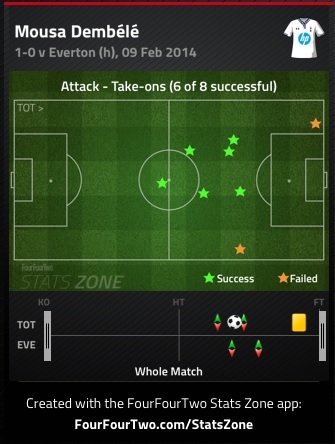 Leighton Baines was relatively ineffective in this match and much of that credit must go to Kyle Walker. With Pienaar drifting inside for most of the match, Walker and Baines were left to battle on their flank mostly by themselves and Walker did a superb job defensively. Walker blocked four crosses, all taken deep from Spurs defensive third, intercepted three passes, all up near the half way line and recovered possession eight times, all on the right flank. Baines completed two of ten crosses(o/4 corners) and did complete 36 of 41 passes, but most were short, relatively simple balls. Paulinho and Dembele didn’t leave much for Bentaleb to do in the holding role as they both put in excellent defensive efforts. The two combined to make nine successful tackles out of eleven and recovered possession sixteen times and were key in keeping Barry and McCarthy, their direct midfield opponents from having any impact on the game when Everton where in possession. Late on Sherwood brought on Jermaine Defoe for Lennon and Spurs went 4-4-2 to see out the final six or so minutes of regular time. Rationally this made no sense at all, Spurs had controlled the middle with three central mids and switching to a central pairing was risky. But, this was a move to get Defoe into the match for his last appearance at White Hart Lane in a Spurs uniform. Sherwood more or less had no choice but to get him in and probably did not want to remove his goal scorer, Adebayor, in a like for like swap. Perfectly excusable under the circumstances and it had no harm on the outcome. Spurs sat a bit deeper after he came on and Adebayor dropped off into midfield in the defensive phase to help the see the game out. This was a stellar defensive effort from Tottenham, they may have only won by a narrow margin and they may not have been as dynamic in attack as usual but Everton rarely lose matches this season and they rarely allow goals. After this match Spurs have allowed the most and scored the fewest goals of the top six teams, they cannot be expected to play in a swashbuckling style every time they step onto the field. Sometimes you have to get everything right defensively, stop the opposition and either take the draw or squeak out the three points. Nativity against top clubs gets punished, as we have seen on several occasions this season. But not today, Sherwood got everything right from the beginning and Spurs got the points. Thoughts, observations and methodologies from an American soccer coach, in an endless effort to better understand and teach the world’s game. Signup and follow my latest blog that I'll get frustrated with and stop writing on in six months!